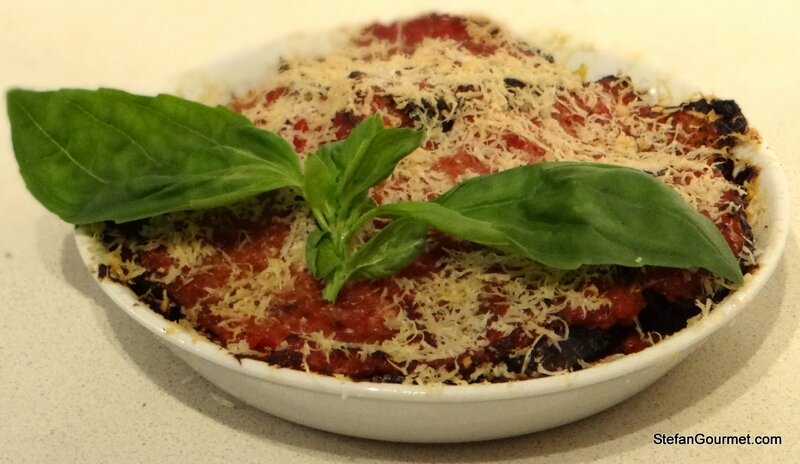 Eggplant Parmigiana is a very tasty oven dish, consisting of eggplant, tomato sauce, and cheese. 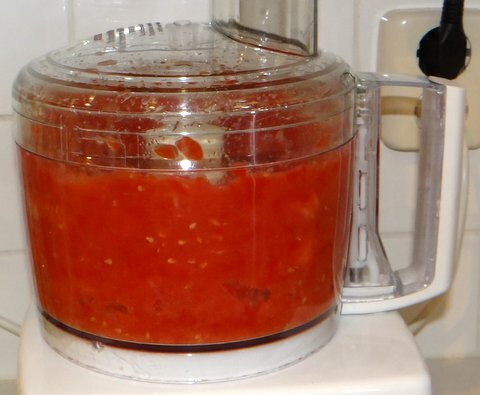 Using fresh tomatoes for the sauce (rather than from a can) takes it over the top. Eggplant, tomatoes, mozzarella, and basil go very well together. This is a classic Italian dish that is clear evidence of how good simple Italian food can be. The main drawback of the classic preparation is that the eggplant is pan-fried with lots of oil, as the eggplant slices are like sponges. 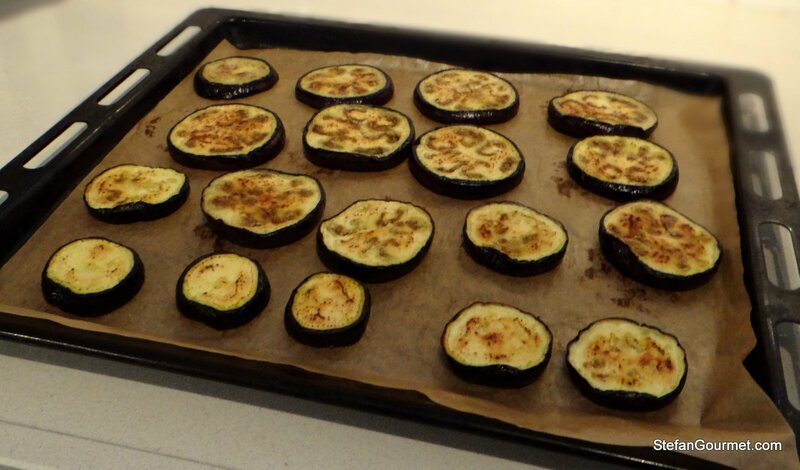 I’ve found a way around that: I roast the eggplant in the oven after only lightly brushing it with oil. 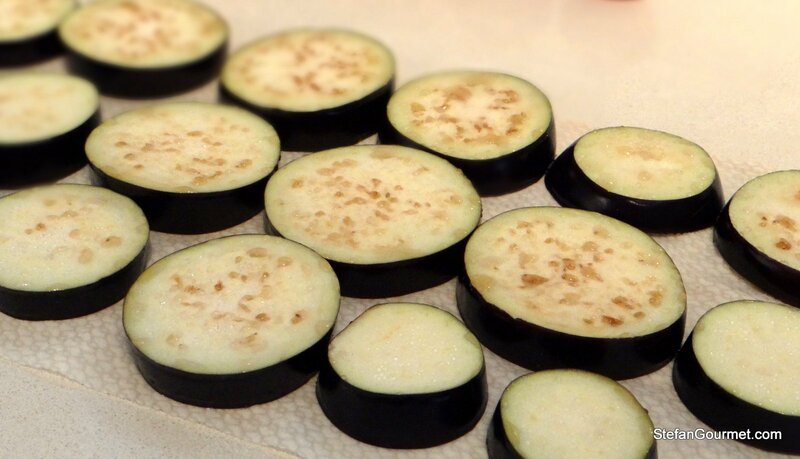 Salting the eggplant slices helps to cook them. In this case I forgot to buy the mozzarella that I usually put on top, and made an even ‘ligther’ version. The parmigiano does not melt as nicely, but it still makes for a nice dish. It’s your choice whether you want to put mozzarella on top or not. Wash and dry the eggplants. Cut off both ends, and cut into 1 – 1.5 cm (1/2 inch) slices. 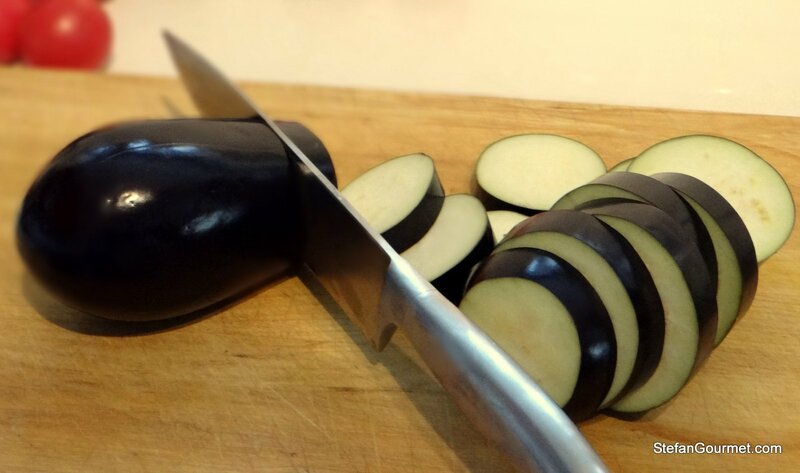 If you don’t like the skin of eggplant, you could peel them first. Arrange the slices on kitchen paper in a single layer, and sprinkle with salt on both sides. Allow to stand for 30-60 minutes. The salt will draw out the juices and will make it easier to cook them. It is also said that the juices that are draw out are ‘bitter’, but I don’t think it’s necessary for that purpose (despite not being a fan of a bitter taste). Some recipes say to rinse the eggplant, but that is really not necessary if you didn’t use a ridiculous amount of salt. Simply pat the slices dry with paper towels. Preheat the oven to 225C/440F. 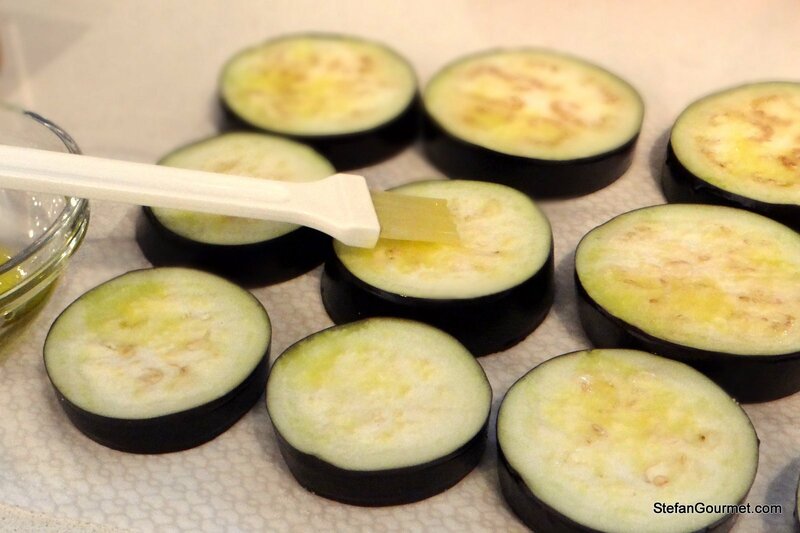 Brush the eggplant slices lightly with olive oil. Do not forget to brush the sides as well. Arrange the slices on a baking sheet and roast for 20 minutes. Turn them over and roast until golden, about 10-15 minutes longer. Prepare the fresh tomato sauce while the eggplant is being salted and roasted. 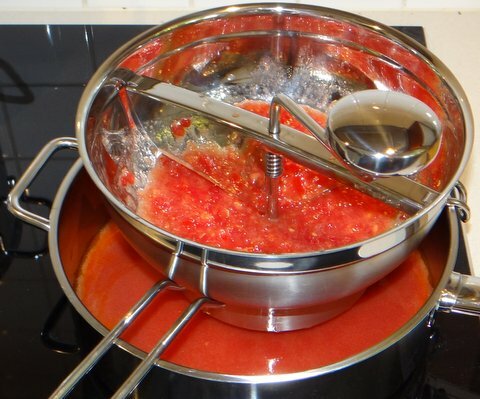 There are different ways to make fresh tomato sauce from scratch. 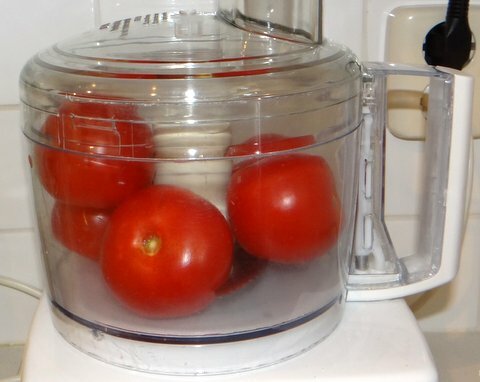 You can remove the skin and seeds and then dice them, but for a fresher taste that uses the juice around the seeds and for an easier preparation, you can also just puree whole tomatoes in the food processor. Just wash and dry them and put them in the food processor. You can also substitute with peeled tomatoes from a can if ripe tomatoes are not available, but use fresh ones if you can. Process until tomatoes are pureed. Use a food mill to sieve out the skin and seeds. Heat 1 Tbsp of olive oil in a frying pan. Add peeled garlic and sauté garlic until golden. This is easier if you tilt the pan as shown. Discard the garlic. Add the sieved tomatoes and season with salt and freshly ground black pepper. 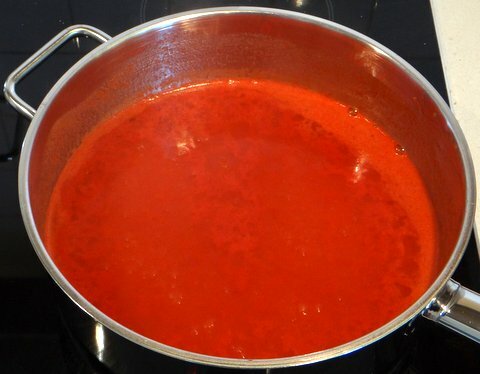 Simmer over low heat, stirring now and then, until the sauce has a medium thick consistency. You are ready to assemble the dish when the tomato sauce and the eggplant are ready. Lower the oven temperature to 200C/390F. 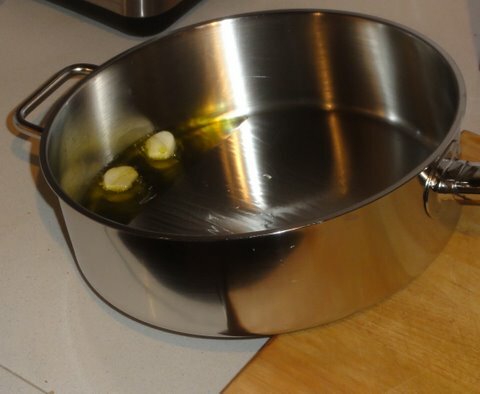 Brush an oven dish, or individual oven dishes, with olive oil. Spread out a thin layer of tomato sauce on the bottom. 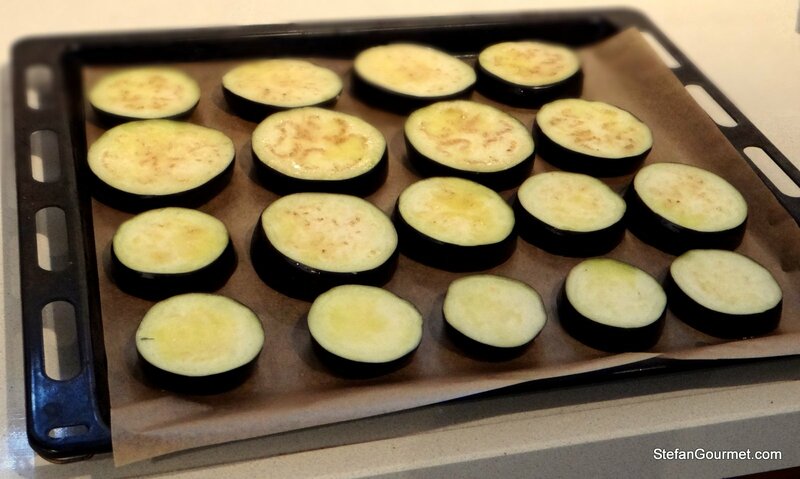 Cover with a layer of roasted eggplant and sprinkle with freshly grated parmigiano. Keep adding more layers of tomato sauce, eggplant, and parmigiano until you have used up all the eggplant. Finish with a layer of tomato sauce. 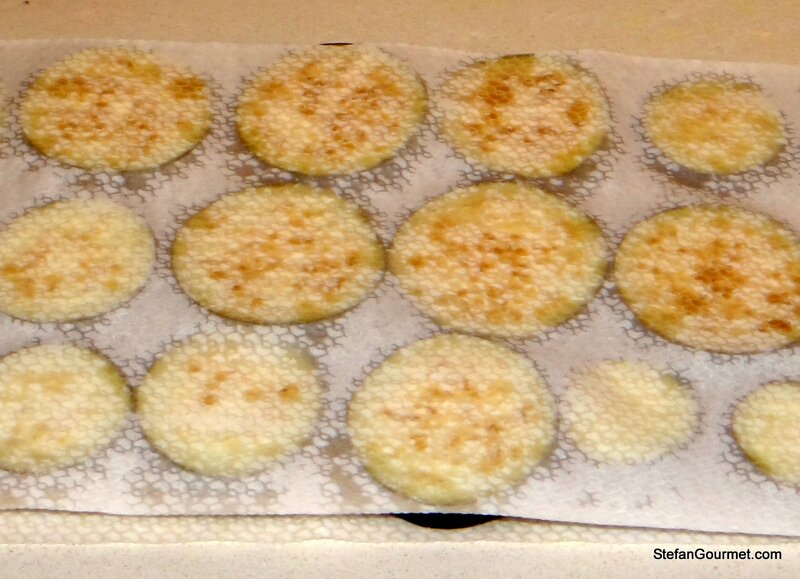 Now cover with shredded mozzarella and/or freshly grated parmigiano. Bake in the oven at 200C/390F until the cheese on top has melted, about 20 minutes. Allow to cool off slightly and serve with fresh basil. 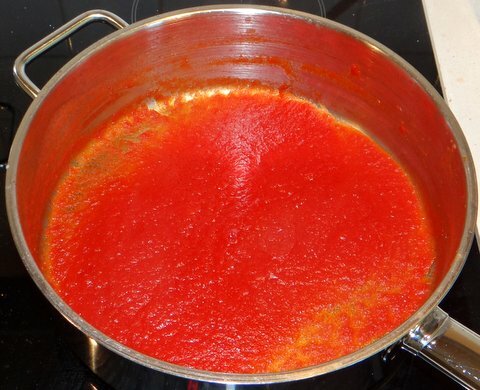 Fresh tomato sauce goes well with chianti classico, or other sangiovese-based Italian reds. Hi Stephan it’s true Eggplant Parmigiana is a very good Sicilian food. I’ve never tried to cook it in a light way, I’ll try. Nicely done, Stefan. I would imagine it has a nice, light, fresh flavor. Love the sprig of fresh basil to finish off the dish. Thanks, Richard. The tomatoes have a nice sweetness that blends well with the eggplant. Hi Stefan, you should try to add mozzarella too! Hi Francesca, I usually add mozzarella, but I forgot to buy it. It was actually quite nice, although the parmigiano doesn’t melt as well. I love this dish! I follow your exact same method for the eggplants and endorse it highly! Ohh good idea with the baking. 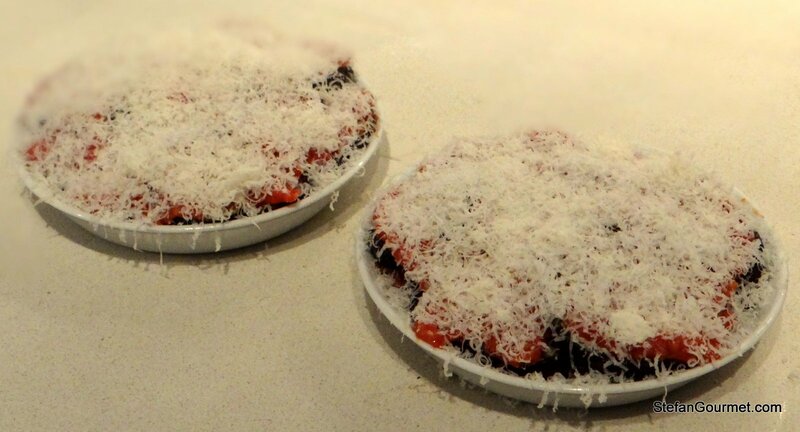 The only way I can get my Dutch/English boyfriend to eat eggplants is to hide them in cheese or sauce, but then they are so heavily loaded, I try not to make them that often. This is a great idea to skimp on the calories without loosing taste. Thanks for the idea, Stefan! Dankje! Isn’t eggplant parmigiana a great dish, Stefan? You kept it light without sacrificing the flavors. Well done! Hope you’re enjoying Sicily. I had a wonderful time there.